Welcome to the third Circle of fifths lesson. 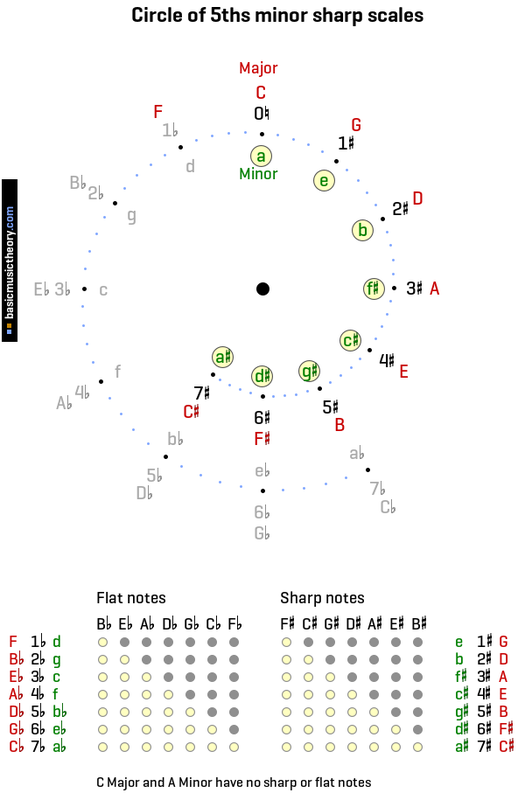 Below are detailed steps to understand and draw the minor sharp scales on the Circle of fifths diagram. Please read the first two lessons before continuing, as they contain background material needed in this lesson. This step shows how to memorize and draw the minor sharp scale labels on the Circle of fifths diagram. In 2. Major sharps, we drew the major sharp scale names (in red) using the Father Charles Goes Down And Ends Battle phrase starting at 11 o'clock with note F, moving clockwise. To draw the minor sharp scale names, this phrase will be re-used in the same clockwise direction, but the first letter will start 3 hours earlier - at 8 o'clock. On the inside of the spiral, start drawing the first note of the phrase (Father) at 8 o'clock, and move clockwise again, drawing in each letter in turn. Next is Charles at 9 o'clock, Goes at 10 o'clock, and so on until all words of the phrase have been used. The last label you will have drawn in is Battle at 2 o'clock, but there will still be spaces for minor labels from there clockwise until the spiral ends at 7 o'clock. 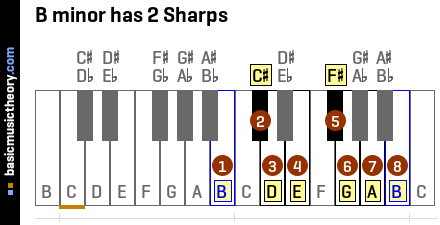 These labels are easy to calculate - just as in the major sharps lesson, when we reached the end of the Father Charles phrase, the phrase began to repeat itself phrase again, but this time adding sharps on to the scale name. The same thing is done for minor sharps too - repeat the phrase, and add sharp accidentals. So the phrase begins again at 3 o'clock with Father, (Sharp), then Charles (Sharp), until the end of the spiral at 7 o'clock. There are still some green minor scale missing labels at 7, 6, and 5 o'clock on the outer spiral - those will be covered in lesson 5. The minor sharp scales will now be covered in detail, showing the key signatures and musical relationship to the adjacent major scales shown in red. This step shows the musical relationships between the A minor scale and C major scale on the Circle of 5ths diagram. 2. 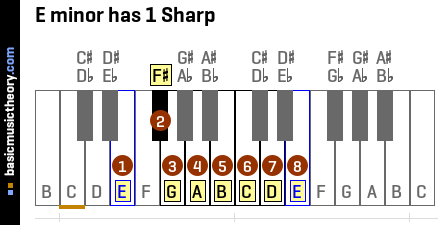 Major sharps started at 12 o'clock (no sharps or flats), so this lesson will start there too, with the A natural minor scale. 1. Introduction covered the music theory concept that every major scale has a relative minor scale, which means that the two scales contain the same note names, but the scales start from a different note, and so the notes are played in a different order. For more details on this relationship for this specific key, have a look at the C relative minor. In this lesson, we are using specific phrases to memorize all the labels and their positions on the Circle of 5ths diagram. However, just as in 2. Major sharps where the 5th note of any scale was used to identify the next scale with 1 additional sharp, different musical intervals can be used as entrypoints to identify the major scale and its relative minor scale for any given node on the Spiral. 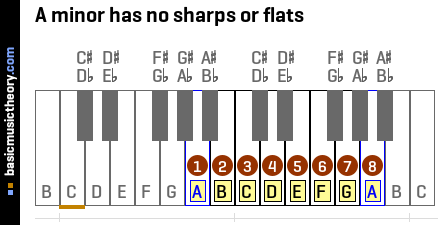 Given any natural minor scale, to identify the relative major key, look at the 3rd note of the minor scale row in the table above. In this case, it is note C, so the relative major key is C major scale. 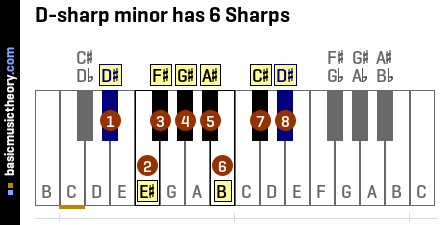 Given any major scale, to identify the relative minor key, look at the 6th note of the major scale row in the table above. In this case, it is note A, so the relative minor key is A natural minor scale. The treble clef key signature for this scale shown above has no sharps or flats, which is the same key signature as the relative major we saw in the previous lesson - C major on circle of 5ths. This key signature is now completed, and we will move clockwise to the next hour position. The next note in the Father Charles phrase after And is Ends, which means that the next minor key to consider is E natural minor scale, at 1 o'clock. But musically speaking, for the previous lesson, we already know that the 5th note of the current scale will identify the next minor scale/hour having one more sharp than the current one. The piano diagram below shows the fifth note of the A minor scale as being note E, which matches our phrase, so E natural minor scale will be the next step. This step shows the musical relationships between the E minor scale and G major scale on the Circle of 5ths diagram. Now we have moved clockwise to the E natural minor scale, which has has 1 sharp, which is 1 sharp more than the previous step. Looking across from the green minor scale label to the red major scale label, the relative major of this scale is G major scale. Having already drawn in the relative major - G major on circle of 5ths, which has the same note names, we know that the extra sharp needed for this scale is F#. From the table below, the 3rd note in this minor scale is note G, which is the tonic (starting note) of the relative major ie. G major scale, which matches the red major note label next to it. The 6th note in the G major scale is note E, which is the tonic note of this E natural minor scale, and the table below confirms that these relative scales contain the same note names, but start on different notes. 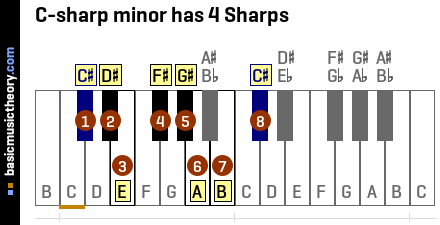 For more details on this relative key relationship, have a look at the G relative minor. The treble clef for this scale shown above has has 1 sharp, which is the same key signature as the relative major we saw in the previous lesson - G major on circle of 5ths. This key signature is complete and we will move clockwise to the next hour position. This step shows the musical relationships between the B minor scale and D major scale on the Circle of 5ths diagram. Now we have moved clockwise to the B natural minor scale, which has has 2 sharps, which is 1 sharp more than the previous step. Looking across from the green minor scale label to the red major scale label, the relative major of this scale is D major scale. Having already drawn in the relative major - D major on circle of 5ths, which has the same note names, we know that the extra sharp needed for this scale is C#. From the table below, the 3rd note in this minor scale is note D, which is the tonic (starting note) of the relative major ie. D major scale, which matches the red major note label next to it. 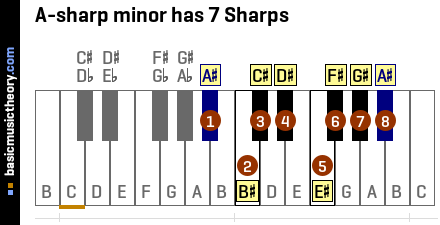 The 6th note in the D major scale is note B, which is the tonic note of this B natural minor scale, and the table below confirms that these relative scales contain the same note names, but start on different notes. For more details on this relative key relationship, have a look at the D relative minor. The treble clef for this scale shown above has has 2 sharps, which is the same key signature as the relative major we saw in the previous lesson - D major on circle of 5ths. This step shows the musical relationships between the F-sharp minor scale and A major scale on the Circle of 5ths diagram. Now we have moved clockwise to the F# natural minor scale, which has has 3 sharps, which is 1 sharp more than the previous step. Looking across from the green minor scale label to the red major scale label, the relative major of this scale is A major scale. Having already drawn in the relative major - A major on circle of 5ths, which has the same note names, we know that the extra sharp needed for this scale is G#. From the table below, the 3rd note in this minor scale is note A, which is the tonic (starting note) of the relative major ie. A major scale, which matches the red major note label next to it. The 6th note in the A major scale is note F#, which is the tonic note of this F# natural minor scale, and the table below confirms that these relative scales contain the same note names, but start on different notes. For more details on this relative key relationship, have a look at the A relative minor. The treble clef for this scale shown above has has 3 sharps, which is the same key signature as the relative major we saw in the previous lesson - A major on circle of 5ths. This step shows the musical relationships between the C-sharp minor scale and E major scale on the Circle of 5ths diagram. Now we have moved clockwise to the C# natural minor scale, which has has 4 sharps, which is 1 sharp more than the previous step. Looking across from the green minor scale label to the red major scale label, the relative major of this scale is E major scale. Having already drawn in the relative major - E major on circle of 5ths, which has the same note names, we know that the extra sharp needed for this scale is D#. From the table below, the 3rd note in this minor scale is note E, which is the tonic (starting note) of the relative major ie. E major scale, which matches the red major note label next to it. The 6th note in the E major scale is note C#, which is the tonic note of this C# natural minor scale, and the table below confirms that these relative scales contain the same note names, but start on different notes. For more details on this relative key relationship, have a look at the E relative minor. The treble clef for this scale shown above has has 4 sharps, which is the same key signature as the relative major we saw in the previous lesson - E major on circle of 5ths. This step shows the musical relationships between the G-sharp minor scale and B major scale on the Circle of 5ths diagram. Now we have moved clockwise to the G# natural minor scale, which has has 5 sharps, which is 1 sharp more than the previous step. Looking across from the green minor scale label to the red major scale label, the relative major of this scale is B major scale. Having already drawn in the relative major - B major on circle of 5ths, which has the same note names, we know that the extra sharp needed for this scale is A#. From the table below, the 3rd note in this minor scale is note B, which is the tonic (starting note) of the relative major ie. B major scale, which matches the red major note label next to it. The 6th note in the B major scale is note G#, which is the tonic note of this G# natural minor scale, and the table below confirms that these relative scales contain the same note names, but start on different notes. 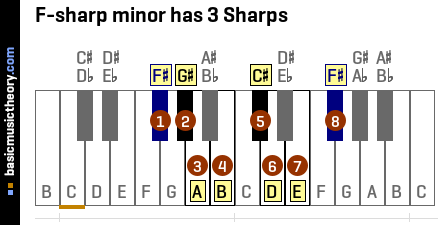 For more details on this relative key relationship, have a look at the B relative minor. The treble clef for this scale shown above has has 5 sharps, which is the same key signature as the relative major we saw in the previous lesson - B major on circle of 5ths. This step shows the musical relationships between the D-sharp minor scale and F-sharp major scale on the Circle of 5ths diagram. Now we have moved clockwise to the D# natural minor scale, which has has 6 sharps, which is 1 sharp more than the previous step. Looking across from the green minor scale label to the red major scale label, the relative major of this scale is F# major scale. Having already drawn in the relative major - F# major on circle of 5ths, which has the same note names, we know that the extra sharp needed for this scale is E#. From the table below, the 3rd note in this minor scale is note F#, which is the tonic (starting note) of the relative major ie. F# major scale, which matches the red major note label next to it. The 6th note in the F# major scale is note D#, which is the tonic note of this D# natural minor scale, and the table below confirms that these relative scales contain the same note names, but start on different notes. For more details on this relative key relationship, have a look at the F# relative minor. The treble clef for this scale shown above has has 6 sharps, which is the same key signature as the relative major we saw in the previous lesson - F# major on circle of 5ths. This step shows the musical relationships between the A-sharp minor scale and C-sharp major scale on the Circle of 5ths diagram. Now we have moved clockwise to the A# natural minor scale, which has has 7 sharps, which is 1 sharp more than the previous step. From the table below, the 3rd note in this scale is note C#, so the relative major of this scale is C# major scale, which matches the red major note label. 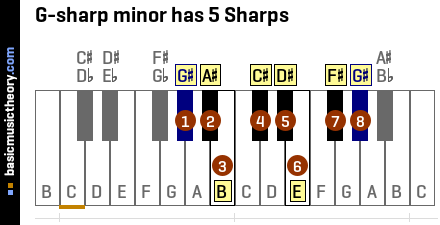 The 6th note in the C# major scale is note A#, which is relative to this minor scale - A# natural minor scale, and the table below shows that these relative scales contain the same note names. The treble clef for this scale shown above has has 7 sharps, which is the same key signature as the relative major we saw in the previous lesson - C# major on circle of 5ths. All minor sharp key signatures have now been completed, and the next lesson 4. Major flats will deal with the major flat key signatures, moving around the circle counter-clockwise rather than clockwise, as we have done so far.